A fire salamander girl getting stolen and taken to hell, where her creator had to rescue her. A were-cougar (?) has a child with a man and leaves him. I might be mixing up the genders. A modern girl talks with Ganesha and his rat and maybe goes on a ride down a New York Highway with him. And maybe (I feel like I am mixing this up with something else) a half-bigfoot girl tries to be human for a while. This book was sold at Ollie's Bargain Outlet a couple years ago, it was kind of thick, perhaps 3 inches wide, and it had a green dust jacket. I believe there was a cougar or perhaps a bear in front of trees with a human next to it. Non-realistic artwork, but well done. 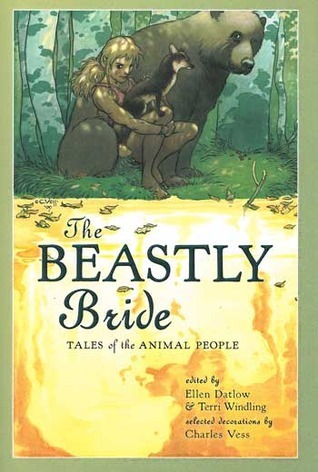 The Beastly Bride - Tales of the Animal People (2009)? This review matches a number of the stories you mentioned. Marly Youmans’ “The Salamander Fire” takes us through farmer’s markets, the mysteries of glassblowing, love and hell in an odd blend of the myths of Pygmalion and Orpheus. Youmans may try to cover too much territory in a short story: there’s all the meat of a novel in here: but if so, there are far worse faults. A were-cougar (?) has a child with a man and leaves him. With the dispassionate eye of a cat eviscerating its mouse, Tanith Lee tells a story of love and disillusionment in “The Puma’s Daughter”. An arranged marriage to a lovely were-cougar takes a very decent young man outside his familiar community — and outside the bounds of his reality — leaving us to judge for ourselves just who (if anyone) has really been wronged. There are two sides to almost every troubled marriage, and Lee very carefully delivers no auctorial verdict to simplify things for us here. Meanwhile, Jeffrey Ford’s odd and delightful “Ganesha” is the only story I’ve ever read of the Hindu deities that treats them with such a blend of whimsy and reverence. His author’s note informs us that a writing student from India told him, “If you write with an open heart, Ganesha will accept it.” And the evidence at hand shows plainly that he took that advice to (open) heart. Gods, demons and the roots of artistic development collide gently and wildly in this off-beat little tale of teen angst. I believe there was a cougar or perhaps a bear in front of trees with a human next to it. Non-realistic artwork, but well done. The cover does have a bear and a girl in a forest. It's quite gorgeous. Found with the Google query fantasy short story collection "salamander" "were cougar" which returned the above review. Not the answer you're looking for? Browse other questions tagged story-identification urban-fantasy anthology-book or ask your own question.